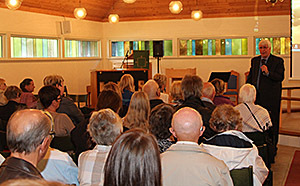 Crowded: Around 230 people showed up in Astafjord church in Grovfjord. Many were also cured of their ailments. - It was a somewhat unexpected to see so many stand up and walk forward to receive salvation. I could hardly believe it to be true what I saw. It is amazing what God has done. 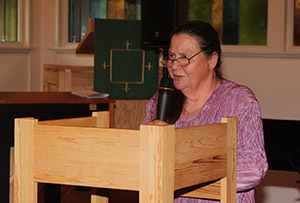 All glory to him, says Astrid Marskar. She was one of the initiators of the weekend event with Svein-Magne Pedersen. 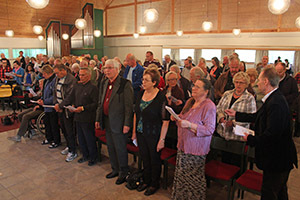 The meetings were held in Astafjord church in the small rural community Grovfjord, Norway with an estimated 370 residents. The town is located in the municipality Skånland in Troms. On Saturday around 40 people were saved, and on Sunday ten people were saved. Two more people were also saved on Monday outside of the meeting setting. - I think we are at the beginning of something really big in Grovfjord, Gratangen and the surrounding districts. We have prayed a lot over the years. Now we have seen a breakthrough in what God has started. This weekend has been a celebration trip, says Marskar. Svein-Magne Pedersen was also very excited. - It's not often I see so many miracles and people getting saved as during this weekend. This was especially on Saturday. It was like a parade, where people stepped forward to be saved. We can almost call it a revival, he said. The two miracle meetings lasted a total of 21.5 hours. People came from the districts around the city of Harstad and and the surrounding regions. Others had traveled even further from places including Ballangen, Lofoten, Svolvær, Tromsø, Alta, Karasjok and Kirkenes in Sør-Varanger. One couple came from Luleå in Sweden. Many experienced getting healed. People with ailments of the back, neck, shoulders, knees and hips were being met by God's healing power. Many people could bend their back for the first time in a long time without feeling pain. Also people with stomach pains, chest pains, angina, psoriasis, sinus infections and headaches experienced God's intervention. Many with poor hearing were able to hear well and put away their hearing aids. A strong prophetic anointing was also present at the meeting, and several got encouragement from the Lord. SATISFIED: Svein-Magne Pedersen was extremely pleased with the weekend's meetings. The meetings lasted a total of 21.5 hours. HAPPY: Astrid Marskar was very happy with what took place in her hometown of Grovfjord over the weekend. QUEUE: Already an hour before the meeting there was a long queue outside Astafjord church.